Is that annoying monthly pain coming on? DIY self-care is the answer, with no meds needed. Don’t let fear keep you from a breast check. Here’s how to find the most accurate screening center. Cecilia’s discomfort from her chronic vaginal itch, burning and discharge made it hard to enjoy life. Here’s the natural protocol that solved it. Kerry came in complaining of hair loss, but she’d also gained weight, suffered from constipation, exhaustion and poor sleep. Natural cures to the rescue! 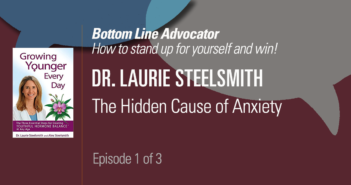 Dr. Steelsmith discusses little-known physiological roots of anxiety and how to treat them in a natural way. Dr. Steelsmith tells you everything you want (and need) to know about vaginal dryness and why it doesn’t mean the end of intimacy. 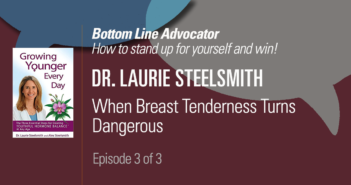 Dr. Steelsmith discusses when breast tenderness is normal, when it is not and what you should do about it. Susan’s breasts were so tender she could not hug her children. Here, the natural approach that turned things around in one cycle. More women die from heart disease than from any other cause—yet this is largely preventable! 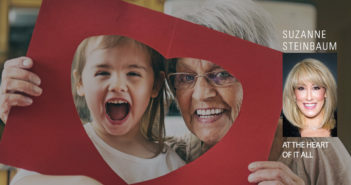 Women: You can take charge of your heart health. There is one thing you can do in the face of unpredictability in both health care and life itself: Protect your own physical and mental health. 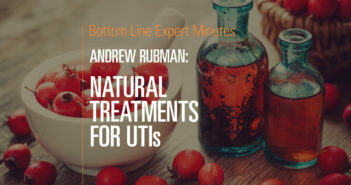 Dr. Rubman discusses how to treat and prevent urinary tract infections (UTIs). One of the best ways is to make sure that the urine is acidic enough. 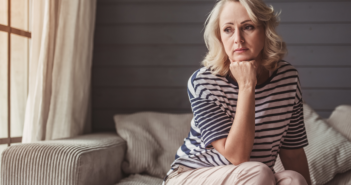 You know about the hot flashes and night sweats, but menopause can put you at risk for other conditions as well…some more serious than others. 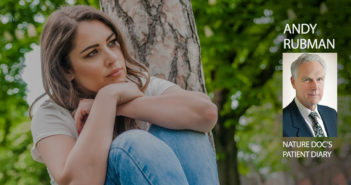 Women with polycystic ovary syndrome (PCOS) now have a new and better therapy for their condition. 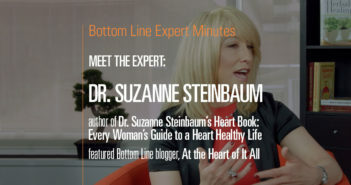 In this video, Bottom Line Inc President Sarah Hiner introduces noted cardiologist and women’s health expert, Suzanne Steinbaum, MD. Hormones really do change how you feel. Once estrogen fades away, so does that impulse towards sacrifice. It’s time to focus on yourself! 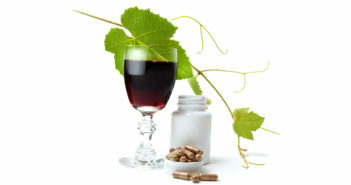 When it comes to blood pressure medication, there are many options. So how does a woman know which medication is right for her? 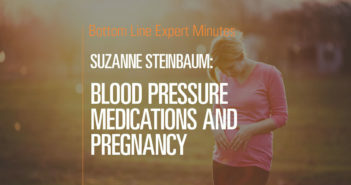 In this video, Suzanne Steinbaum, MD, explains that pregnancy is the first metabolic stress test that many women face in life, so it can reveal issues. More pregnant women die from heart attacks than from any other cause, according to a new study. 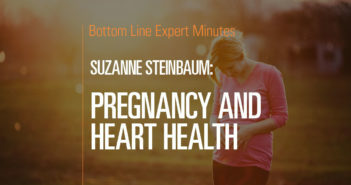 In this video, Suzanne Steinbaum, DO, author of Dr. Suzanne Steinbaum’s Heart Book: Every Woman’s Guide to a Heart Healthy Life and Bottom Line’s “At the Heart of It All” blog, explains that pregnancy is the first metabolic stress test that many women face in their lives, so it can reveal an underlying heart issue. During pregnancy, the arteries need to dilate and supply blood to the growing fetus. But if these arteries are not healthy, other conditions such as high blood pressure, preeclampsia, gestational diabetes and more can come to light. 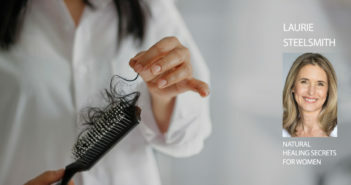 Fluctuating hormones also can cause a heart attack and related problems. In order to prevent these cardiac health concerns, Dr. Steinbaum suggests that women should approach pregnancy as if they were training for a marathon—taking diet, supplements, weight loss and exercise into account as they prepare for their baby’s birth. The healthier you are when you get pregnant, the less likely you are to have problems during the pregnancy. 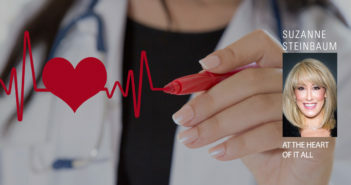 Obesity can increase risk factors, but being skinny does not make a woman immune to heart health issues when expecting. If you have any chest pain or shortness of breath while pregnant, be sure to speak with your doctor—it could mean the difference between life and death. Dr. Suzanne Steinbaum is a cardiologist, author and spokesperson for the American Heart Association’s Go Red for Women Campaign. She has devoted her career to treating heart disease through early detection, education and prevention. For more great tips from Dr. Steinbaum, check out her other videos and Bottom Line blog, At The Heart Of It All.